If you’ve been following Gazette665 for a while, you’ll know I’m interested in civilian accounts. (If you’re a new follower, welcome…and you just learned one of my “secrets.”) So, as we’re wrapping up our blog series on American entering World War I, it seems only right that we’d have a blog post about civilians and the homefront. 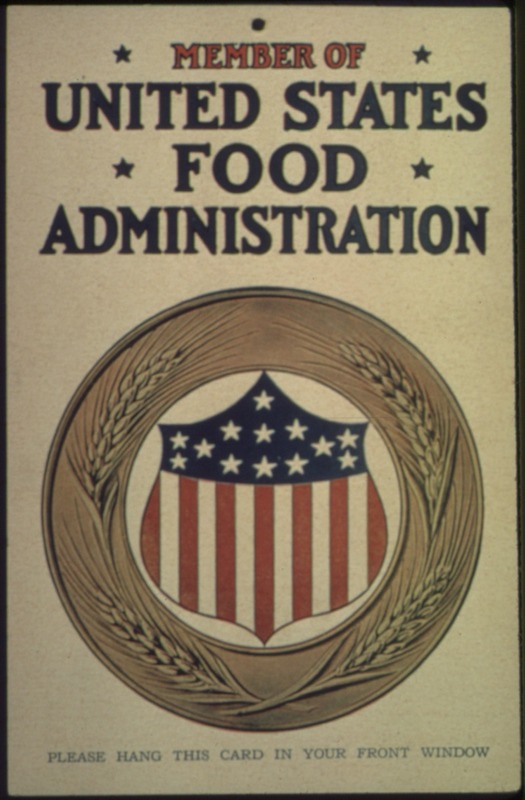 Food Administration didn’t impose rationing, but it worked though positive propaganda to encourage food conservation. Wars (or threats of conflict) generally allow government regulation to increase in America. Out of necessity or through the citizens’ fears, federal leaders create more bureaucracy – although in World War I, they were temporary agencies. During times of conflict, these new organizations and agency served an important purpose in oversee and regulating the output of the homefront. Remember, America entered World War I “late” and mobilization had be swift. To regulate and motivate the homefront to support the armies, various boards and committees were organized – some were federal controlled, others merely had federal support. Some of these included the War Industries Board, Shipping Board, National War Labor Board, Food Administration, Fuel Administration, and Committee of Public Information. Their new roles were in the medical and clerical fields. Thousands of women volunteered, received basic training, and were sent to military hospitals within the United States and overseas. Telephone operators and stenographers also played important roles for the U.S. military. Fluency in French and English might gain a young woman a position as a “hello girl” (telephone operator) in Europe. With millions of men enlisting in the U.S. military, factory, farm, and clerical jobs had to be filled. About a million women left home and entered the workforce. Alongside them came retired and young men – too old or not yet drafted. After the war, most women returned to their traditional homemaking roles, but some wanted to stay in the workforce, enjoying the liberation they had gained because of the conflict. World War I – for better or worse – opened the door for women to take an active role in the factory and business world of the U.S.A. Unlike World War II with mandatory food rationing, there was only voluntary rationing and conservation during 1917-1918. 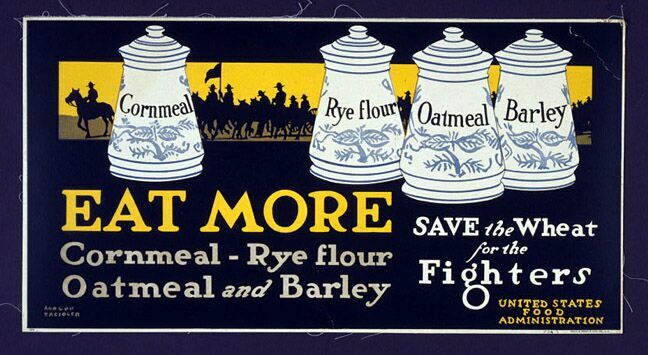 Though a highly successful, encouraging propaganda campaign, Americans realized they could end the war soon if the army and the hungry civilians in Europe had food. For the first time in U.S. History, the county used Daylight Savings Time, giving the farmers more time in the fields and reducing the amount of fuel needed for lighting! 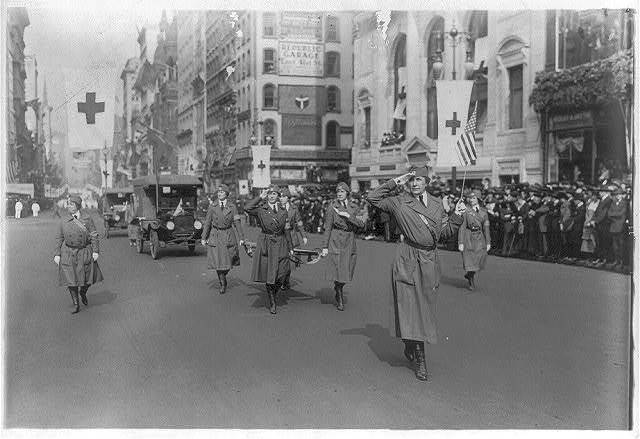 Volunteerism was a big deal during World War I, and there were quite a few large organizations: Red Cross, YMCA, Salvation Army, Boy Scouts, and Girl Scouts. And, of course, there were smaller organizations in cities and communities. Collecting scrap metal and peach-pits (the latter used in gas mask filters), knitting, preparing medical supplies, food packages, and relief packages for the military and European civilians filled the days. Then there were volunteer jobs that directly supported the military. One of the best known from the 1917-1918 era was the YMCA “hospitality tents.” With cheery music playing the background and jolly smiles, those volunteers made thousands of doughnuts in their stations at home and overseas to keep up military morale. 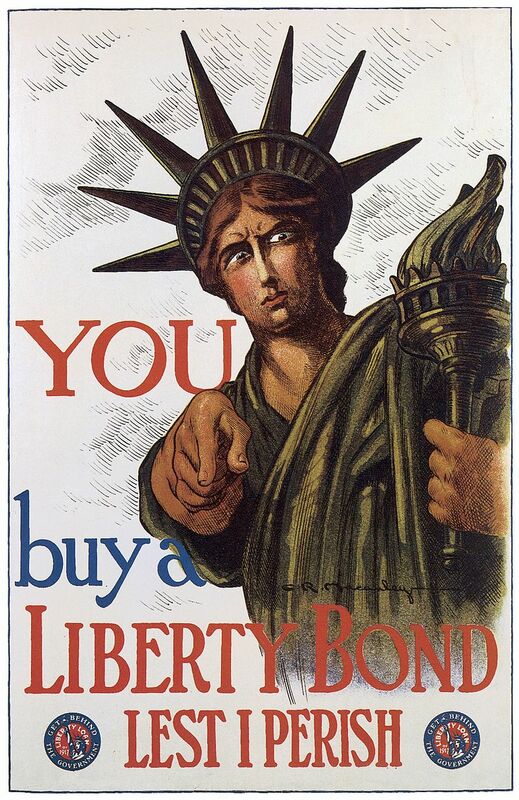 Most volunteer organizations and all civilians who supported the war effort purchased war bonds to fund the military and American involvement in the conflict. Approximately 65 million Americans participated in the loan drives and raised over $21 billion dollars. Additionally, about $4 billion dollars was donated by civilians to assist private, non-military organizations, like the Red Cross, YMCA or Salvation Army. Many Germans had immigrated to America in the decades prior to World War I, and the majority professed and showed their patriotism for the U.S. cause. However, there was sort of a phobia against German-named items during the conflict. Names of commonplace items were changed. For example, “sauerkraut” was renamed “liberty cabbage.” Many schools dropped German language classed from their programs. Bands and orchestras reduced the music of German origin on their programs – even though it was written centuries earlier. World War I pushed the United States into a patriotic frenzy. Enlisting (or drafted) soldiers departed, leaving civilians on the homefront. Though relatively safe since the Atlantic Ocean separated them from the conflict, American civilians still rallied to the cause, celebrating their homefront power, entering the factories, working late hours on the farms, voluntarily rationing, taking roles in the military reserves, giving for the war loans, and supporting the military through various organizations. 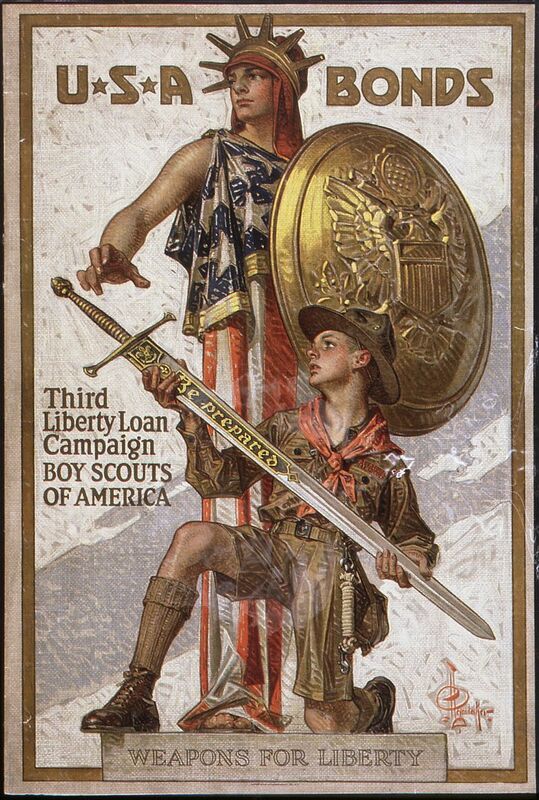 Culturally, flags and patriotism ruled the day in posters, advertising, music, and even clothing. The civilian efforts in World War I are often overshadowed by the experiences in World War II, but had American not joined the conflict – our world would undoubtedly have been a different place…and the U.S. would’ve held a very different role in the modern world. P.S. What’s been your favorite topic in our World War I series?